Hardcover, 10 x 13 in. / 284 pgs / 257 color. The photographic surrealism of David LaChapelle explodes in the conjunction of flaming pianos, giant hamburgers, and Day-Glo disaster sites. Text by Otto M. Urban. The photographs of David LaChapelle (born 1963) are among the most instantly recognizable images in contemporary photography. His über-pop color portraits of celebrities such as Cameron Diaz, Marilyn Manson and Kanye West (whom he has portrayed, respectively, as King Kong, a crossing guard and Black Jesus) have propelled his work outside the closed society of galleries and museums into a wider public arena. Thus Spoke LaChapelle is the first retrospective of the artist’s work to include photographs from the mid–1980s up to the present, plus a range of work that has never previously appeared. More than an exhibition catalogue, this book presents the culmination of LaChapelle’s artistic activity to date: a world in which religious iconography comes in pink latex trappings and a new surrealism explodes in the conjunction of flaming pianos, giant hamburgers, orally fixated Triceratops and Day-Glo disaster sites. 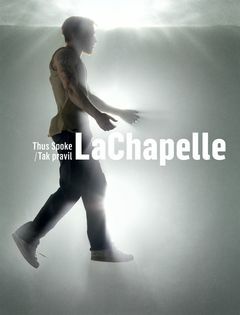 Featured image is reproduced from Thus Spoke LaChapelle. FORMAT: Hbk, 10 x 13 in. / 284 pgs / 257 color.